n 1993, Nimba Anvils was founded with the goal of providing the best quality double-horn anvils manufactured in the United States. There are three distinctive features of the Nimba anvil: the thick-waist of the anvil body, the placement of hardy and pritchel holes in the face of the anvil, and the dimensions of both the round and square horns of the anvil. Working your material directly over such a large mass provides superior stability, giving your blow the greatest possible power. You can work hard even at the very end of the tip of either horn without losing any of this stability. The hardy and pritchel holes are placed close to the body of the anvil to take advantage of its thick-waisted center of gravity. Any operations involving the hardy/pritchel holes (punching and drifting) or using tooling (hot-cut, side-cut, butcher, etc.) are more effective. In this way, the superior stability of our anvils comes from an intelligent use of the physics of the core mass. The dimensions from tip of round horn to tip of square horn and the width of the face make Nimba anvils one of the most generous and versatile of working surfaces. The taper of our square horn is an especially graceful line to a real point, providing the greatest variation of surface width of any anvil we know. This variation of surface width allows the broadest functionality. There are no special gadgets built into our classic design and the anvil�s adaptability to a variety of smithing applications is only limited by the smith�s skills, not the inherent design of the anvil itself. We pride ourselves in our manufacturing quality. The most skilled and experienced foundrymen, machinists and heat-treaters in Seattle are using the best equipment and technology available to make pristine castings with toughness and resilience. We use 8640, a high-grade nickel-chromium-molybdenum steel known for its yield strength, impact toughness, and exceptionally deep hardening properties. Our anvils are cast in one piece rather than in separate parts welded together. Each anvil is individually heat-treated and tempered and we test each to guarantee hardness within a range of 50-52 Rockwell. 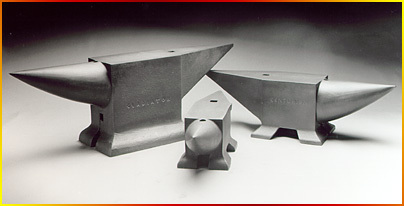 The entire anvil is heat-treated which penetrates all surfaces of the anvil, preventing long-term deformation. The final inspection and grind-finish results in the most beautiful anvils made in the world today.